Il nome scelto per questo ristorante di via delle Moline, è un’espressione tipica bolognese. Una volta c’era qui una famosa libreria dove spesso si sostava oltre l’acquisto per discussioni e scambi di opinioni sulle letture. Giovanni, che ha rilevato tre anni fa questi spazi, ha voluto mantenere con quel passato colto un legame forte, la definisce una librosteria. Ha continuato ad ospitare molti volumi alle pareti e restaurandolo con le sue mani, ha ricreato un’atmosfera di casa, accogliente, un luogo che ora celebra la buona cucina bolognese e la sua cultura. Vera rarità, solo cuochi “autoctoni”, le ricette sono quelle della nonna, delle famiglie, ritrovate e riproposte come il Balanzone, sfoglia verde ripiena di ricotta e mortadella o il dolce al mascarpone. Vini selezionati dal territorio. 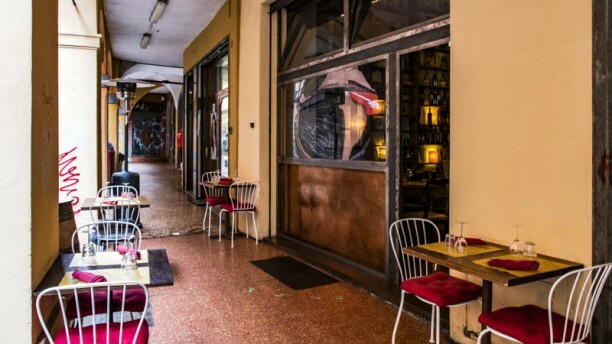 Cibo per il corpo, bicchieri per lo spirito e libri per l’anima è il motto di questo locale che invita alla sosta prolungata, un luogo gestito con il cuore il senso dell’ospitalità tipici di Bologna. Always a pleasure to eat at this place! The food is outstanding, and they serves the best lasagna in Bologna!! This is my fifth time at this restaurant, and the atmosphere and the staff is always friendly! Really recommend this place if you are looking for a authentic taste of Bologna! This quirky but delightful restaurant has excellent food with slightly limited menu choice, but very tasty! Great ambience surrounded by bookshelves, but certainly not a library as everyone chatty and enjoying themselves! Staff and service wonderful! The best food experience in my 7 day trip at Italy. Amazing food and staff, best lasagna I’ve ever had!! We enjoyed our meal but having read the reviews on TripAdvisor we had been expecting something just a little bit more special. The 'Welcome to Bologna' starter was rather heavy on the mortadella and lacking in tasty cheeses. I felt that my tortellini was a bit on the grainy side - although the broth was delicious and my daughter's tortellini in cream sauce was smooth enough. The restaurant had a really good atmosphere though and we received a very warm welcome. So glad we found this gem! Lovely cosy atmosphere with great food and service that couldn't have been better. Will definately return when in Bologna. It was ok food, nothing spectacular. Nice restaurant, good service and lovely food. The food was amazing. From the starter, to the main course to the desert! And the atmosphere was very nice too, with a lovely and unique style! Was delighted to discover that Vo Lo MA is vegan friendly...and creatively, deliciously so. I'm very sorry that it was "November 28" I would like to book, and it's my bad to get the booking date wrong. I'm really sorry for any inconvenience I brought. Truly hope you could accept my apology and hope I still have second chance to visit your beautiful restaurant.